Though a sway back is commonly perceived as good posture, most people recognize it to be a problem. What is the best way to fix a sway? And for those of you who don’t quite know, what is a sway? Arching the low back is common and problematic. A swayback is an inappropriate curve usually in the upper lumbar spine. It is frequently the result of trying to “sit up straight,” or “stand up straight” in a sustained way. Sometimes it is the result of modern activities, most notably women’s gymnastics, women’s ice-skating, women’s ballet and misguided forms of yoga. The directive to "stand up straight" often results in a swayed low back. Swaying compresses the discs and decreases circulation around the spine. I know this problem intimately. Having done a great deal of misguided gymnastics and yoga growing up, I had a very pronounced swayback in my twenties. People complimented me on my posture (sways certainly make you appear upright), but I blame the sway for weakening my lumbar spine and the resulting problems I had with my back in my mid-twenties (this is no longer such a young age to have back problems, I regretfully note). Esther demonstrating her previous habit of arching the back to be "upright"
The conventional fix for a sway is to tuck the pelvis. But this causes as many problems as it solves. It is true that tucking the pelvis usually flattens a swayback, and often feels good because it stretches out the low back muscles, but tucking the pelvis also compromises the wedge-shaped L5-S1 disc. In my own case, I suspect that the tucking exercises I was taught after my initial episodes of back pain in my teens and early twenties contributed to my more serious L5-S1 disc herniation problem in my later twenties. The better way to address a sway is to tuck the ribs. By this I mean rotate the ribcage forward so as to make the lower border of the ribcage flush with the abdomen. As the lower ribcage descends and retreats into the contour of the torso, the lower back lengthens, flattens and has a healthier architecture. 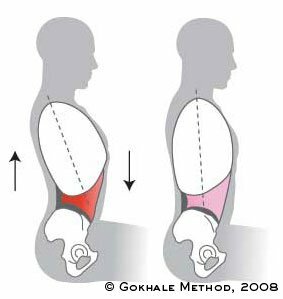 Tucking the rib cage-- a healthy way to flatten the low back. This move is usually quite difficult for those who need it most. 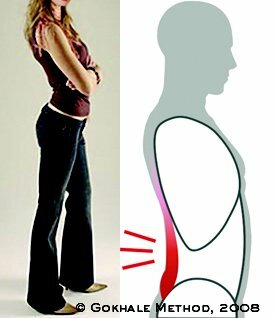 If you have been swaying your back for years/decades, tucking the ribs makes you feel hunched (it shows whatever hunch you have, which you now want to address directly with shoulder rolls, neck lengthening, etc.) and ape-like. A quick glance in a mirror should reassure you that you don't look the way you feel. This is always a major aha! moment in our Gokhale Method Foundations course. So there you have it - tuck your ribs, not your pelvis! I would like to be clear here about this move you recommend, but how on earth one tucks their ribs or rotate the ribcage forward? Unfortunately, your descriptions and instructions are too vague for me. Every time I try to Tuck in my rib cage with my fist, my pevils tucks in. I just don't seem to understand. This is common - it means you are much more clued into using your rectus abdominis muscles than your internal obliques. Go very slowly to give this new pattern a chance. It can also help to assume a "ready" stance (like in sports), which makes it easier to maintain your pelvic position no matter what else is going on up higher in your body. If I've understood it correctly, 'sway' means that the hips are swayed in front of the ankles which also creates compensatory changes like slouching and forward head posture to the upper body. The back also has an arch because of the weak core and this is why sway back is often mixed up with anterior pelvic tilt. This works for me when I tuck my pelvis or bring it above my ankles. The tuck gives me the final relief. This is not possible if hamstrings and anterior tibialis are tight. Core, glutes and hip flexors also need a workout and I have to release the thoracolumbar region. Im not a pro so not sure if this the most recommended solution. This is a simple, but not at all easy, technique. Unfortunately, it's hardest for the people who need it the most! Show up for one of our free workshops all over the world, and one of our teachers will help you find this move as part of stretchsitting. Stretchsitting also helps your brain "memorize" this new way of being with your ribcage. Place your forearm across the front lower border of your ribcage and gently push backward into your body. You may feel like you are doing a mini-crunch, but without your rectus (6-pack muscle) engaging. Place your fist just below your breast where you feel bone and gently push backward into your body as above in 1. Do any of the exercises in the back of 8 Steps to a Pain-Free Back between pages 198-201 to not only identify, but also strengthen these muscles. Kinesthetic things are best learnt from a teacher / coach, but you can make a good beginning with the book and our online resources. Good luck! Thanks for the info in this entry on sway back. Have singers commented on this position? 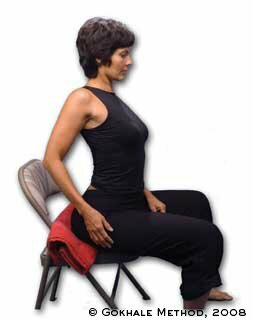 It seems like this position would encourage breathing laterally and/or into the lower back which are all good in my book. I totally agree. I think its because I expand my ribs so much ( i breath deeply) that I need to also be more aware of expanding laterally rather than that which can force my ribs forward. This blog post above is really like a revelation. I mean i remmeber that being the way I corrected my posture previously when doing hand stands but go figure planted firmly on my feet or lying down I need the subtle remembrance to tuck my ribs into alignment. Singers seem to appreciate the techniques we teach, including rib anchor and especially inner corset. For singing, diaphragmatic breathing becomes more important as it's a way of controlling the voice, projection, and such. I'm eager to learn more from the singers among us! I just have to say God Bless you. Im a yogini and have dabbled with acro so i know exactly what you mean by tuck your ribs, im a bit out of practice though and forced into an office situation for a stretch. I also have a bad lifelong habit of sway back. Anyway I never do this, but i signed up to comment and say this was the frst post that gave good advice. Especially that bit about how tucking the tailbone can excerbate it. I had to sign on and say how grateful I am a second ago I was tucking my tailbone for the hundredth time in pain and now I've tucked my ribs and its completely gone! Super grateful Godbless. Rib tuck, in order to maintain I have to engage the transverse abdominal muscle, is this correct? No, it's the internal obliques, not the transversus abdominis, that you want to engage. I have a question. How do I keep the sternum throughout the rotation of the ribs? Does the sternum in fact stay high, like horizontally, so that I don't compress the lumbar spine all the more while tucking the ribcage? Also, how high does the lumbar spine reach looking from the front of the body? Does it reach to the solar plexus/xiphoid process area or a bit lower toward the belly button. I of course started doing this by compressing the spine. Anatomy is hard in real time because the lowest ribs are actually starting from higher in the spine than how they appear to sit on your sides. The descriptions of the ideal for the sternum and lower border of the ribcage can indeed seem contradictory. You want your sternum high, angled significantly from the vertical, while you want the lower order of the ribcage pulled in and down to be flush with the contour of the abdomen. And there's not much give within the ribcage/sternum complex - so you may well wonder how you can possibly achieve both! The answer is that the bones in the ribcage/sternum change shape when you change the stresses on them. These bony changes take months / years to materialize, but materialize they will if day in and day out there is an entirely different set of pressures / stresses on the bones. The biggest changes around the shape of the ribcage happen as a result of an altered pattern of breathing (you want to NOT belly-breathe as your default) and an altered way of using your abdominal muscles (you want to learn to use your internal obliques more than your rectus abdominis for basic ab strength). One of the places that can change shape most quickly is within the sternum, at Louis' angle, where there is cartilaginous joint rather than fused bone. See the before and after pics of my husband Brian White on page 27 in 8 Steps to a Pain-Free Back to get an idea of just how much change is possible in the sternal angle while maintaining healthy architecture throughout the ribcage - note also that there is at least a decade between the photos! क्या नहीं मिला जो आप खोज रहे हैं?